The Trump administration's inhumane policy of tearing children out of their parents' arms at our border goes against our basic humanitarian values as Americans. I witnessed the impact of this policy firsthand the day before Father's Day when I visited with asylum seekers at a detention facility in Sheridan. I met a father who had no idea where his 18-month-old baby was. Punishing families for risking everything to escape the violence and horror of their home countries — terrorizing innocent children that is not who we strive to be. At the moment, we're working to get as many answers as possible about the well-being of these children. At a Senate Finance Committee hearing just this week, I pressed HHS Secretary Azar over these policies and he squirmed his way out of giving any answers that passed muster. I asked Secretary Azar two simple questions: how many children HHS has reunited with their parents or relatives, and how many parents have been told where their children are. The agency's process for notifying parents where their children are located seems to be to tell them to call a hotline or send an email. That is just disconnected from reality. Most of these parents are being held in detention centers themselves. And news reports have indicated many parents are having problems getting through to the hotline and getting the information they need to find their kids. Azar also gave me different answers as to how many children are in the agency's custody. That's completely unacceptable. Thankfully, we received welcome news earlier this week from a judge who issued an injunction that requires the administration to reunite families within 30 days. The administration has a lot of work to do to safely and securely reunite this families in the next 30 days. They must ensure the safety of these children while also protecting the privacy of their family members. The bottom line is these parents - and the American people - still don't know how the Trump administration plans to protect and reunite the thousands of children the administration separated from their mothers and fathers. In the coming days and weeks, I will fight tooth and nail to help protect children and asylum seekers and oppose the cruel and inhumane policies this administration has adopted. Thank you for standing up for justice and keeping families together. Many of the individuals and families seeking protection at the U.S border are fleeing horrific violence and have legitimate requests for asylum — a protection long enshrined in U.S. and international law. Criminalizing victims of violence and traumatizing children is not public policy — it is simply cruel. I am outraged by the callousness of this administration and have called on the president to abandon his zero tolerance policy. Earlier this month several of my home state colleagues and I went to the federat prison in Sheridan to visit more than a hundred immigrant detainees — some of whom have not talked with their families in weeks. We demanded that the government improve their conditions and respect their due process rights. When a U.S. District Court judge in California ruled that the government's conduct 'shocks the conscience' and required the reunification of families in 30 days, I led 79 of my colleagues in demanding details about the administration's plans for complying. There are more than 2,000 children who have been separated from their parents as a result of this administration, and I will keep fighting until all of them have been reunited. And then I will fight to make sure it never happens again. Thank you all for coming out today! But over the past several weeks, the world has watched America turn its back on those words and shut that golden door. 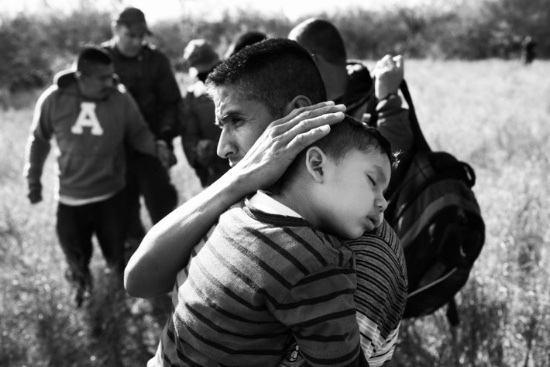 Under the Trump Administration’s “zero-tolerance” policy, families along our southern border—the tired, poor, tempest-tost, fleeing violence and persecution—have been met with inhumane cruelty as children are ripped from the arms of their parents. We have all seen the photos of the cages, the floor mats, the Mylar space blankets at the processing center in McAllen, Texas. We have seen the images of six young boys sharing rooms meant for four at the Brownsville detention center. We have listened to the recording of young children wailing for their parents. We have read the heart-wrenching stories of desperate parents who have no idea where their children are, nor when or if they might see them again. To justify his cruel policy, President Trump has presented the American people with a false choice: Either you are for closing off our borders and inflicting harm on innocent children as a deterrent to the world’s asylum-seekers; or you are for completely open borders, thereby risking the lives of the innocent Americans. That is just wrong. That is a false choice. And this false choice is insulting to the American people. Through President Trump’s misinformation and false choices, Americans said loud and clear, this is what we know: We know that that is not who we are as Americans. We know that we do not use cruelty, especially against innocent children, as a weapon. We know that we are better than that. That’s why over the past few weeks, public outrage grew to a point that even President Trump could not ignore. It was that public outcry—YOUR voices, YOUR action, YOUR pressure—that forced President Trump to sign an executive order halting his cruel policy—a policy that his team said did not exist, and that he claimed Congress alone had the power to end. But this story of cruelty and terror did not end with the president’s executive order. In fact, that order has created even more chaos in its wake. Thousands of children are still separated from their parents, with no plan to reunite them. 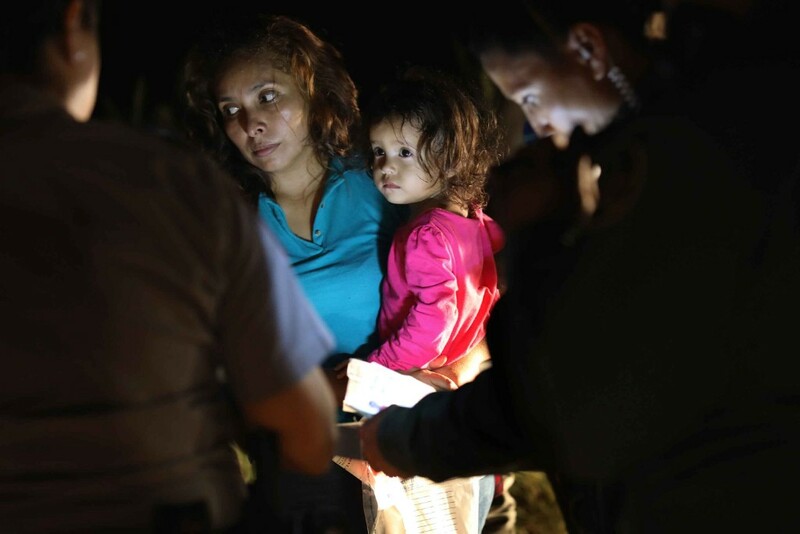 And the administration’s “zero-humanity” policy might now be replaced by “Handcuffs for All,” as the Trump Administration now proposes to throw entire families in jail, possibly on military bases and in internment camps out in the desert. Once again, we need YOUR voices, YOUR action, YOUR pressure to send a clear message to the president and his administration: Like “zero-humanity,” we will not let “Handcuffs for All” stand. Our top priority needs to be ending this unnecessary cruelty and reuniting thousands of girls and boys with their parents. We must put these families back together and give them the opportunity to make their case for asylum. We must restore the vision of Lady Liberty. Sign up here by 10 a.m. to participate. Rally with INCO to protest the Trump administration’s chaotic, contradictory, and cruel immigration policies and practices, including proposing indefinite incarceration of migrant families, ignoring families seeking asylum, delaying reuniting immigrant children separated by the US government from their parents at our southern border, and refusing to increase the number of immigration judges. INCO is one of a coalition of groups demonstrating around the country, including in DC, on June 30. 3. Do not block pedestrians or vehicles. 4. Be respectful to all passersby, even those who disagree with our rally. 5. Do not engage with hecklers. Do not park in the Columbia River Maritime Museum parking lot. It is not a public lot and is for museum use only. If you're on foot, cross Marine Drive at the light at 14th or at the crosswalks at 16th and 17th. There is on-street parking on Marine Drive from 16th west through downtown, and limited parking as you turn on 14th toward the river, along the Riverwalk, and along other north-south streets. There is one handicap space in the area - along the Riverwalk, just as you turn north on 14th from Marine Drive. There is more parking available on the streets on the other side of Marine Drive. Questions to incoregon@gmail.com. US Representative Suzanne Bonamici says these organizations are helping immigrant families separated at the border. You can contribute here. The news changes daily about Trump-created chaos in immigration, trade wars, corruption, and authoritarian governance. Please thank Senators Cantwell, Merkley, Murray, and Wyden and US Representative Bonamici for working to restore decency in America's treatment of migrants. They need to hear from constituents who like their advocacy and votes against separating families at the border and about other issues. 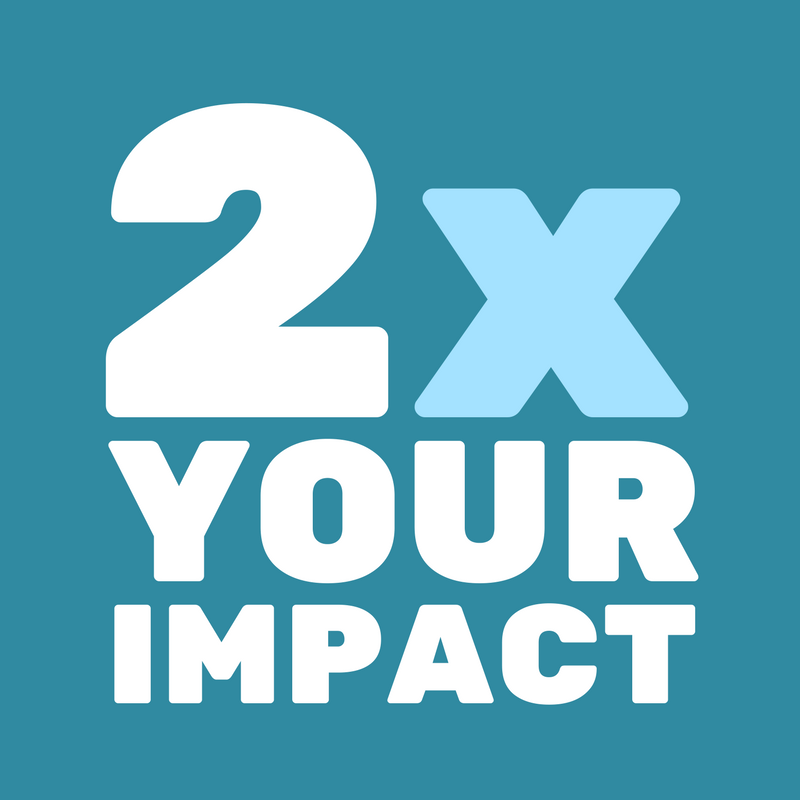 • Develop a humane, practical bipartisan immigration policy that includes reuniting families forcibly separated by the US government. Info and opinion columns here. • Protect all Americans. Stop the bigotry and oppression by Trump and his administration. Stop attacking America's allies and embracing America's totalitarian enemies. Provide meaningful help for Puerto Rico's recovery from Hurricane Maria. Oppose nominees to be federal judges who fail to support equal rights for all people. Stand with people who need help getting medical care and enough food to eat. Friday, June 29 - Postcards to Voters Writing Party, 4 - 5:30 pm, Gearhart. Contact Bebe at littlebylittle4change@gmail.com for address. Note the new time. If you can, join us afterwards for food and drinks at the Sand Trap. Saturday, June 30 - Rally to Keep Families Together, 11am - 12:30 pm. New location: the north side of Marine Drive at 16th, Astoria. Bring your signs and chants. Read guidelines and parking suggestions above. Wednesday, July 4 - Walk with Seaside/Gearhart INCO and Warrenton INCO in the Seaside 4th of July Parade. Details below. All Indivisibles are invited to parade with INCO. Saturday, July 7 - Astoria INCO Community Group meeting, 8 a.m., Street Fourteen Cafe, 1410 Commercial; no purchase necessary. 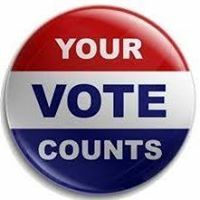 Wednesday, July 18 - INCO Vote the Future Team, 6:30 pm, Seaside Library Board Room. All Indivisibles interested in voting and elections are welcome. 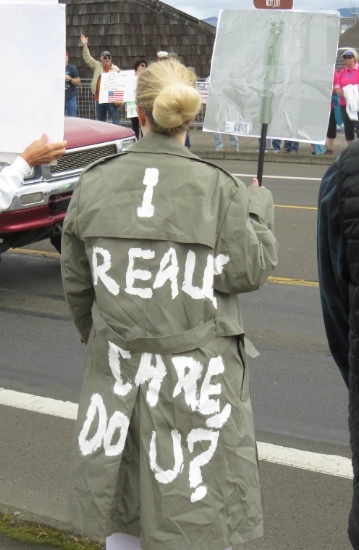 Wednesday, July 18 - Keep Russia Out of Oregon's Elections - Confront Corruption Event, 8:18 pm, at the big orange Seaside Chair at the corner of 101 and Broadway in Seaside. Bring signs and drums. Wipe out corruption with a Blue Wave 2018. Saturday, July 21 - Warrenton INCO Community Group Meeting, 11 am, Dooger’s Seafood and Grill, Highway 101, Warrenton. No purchase necessary. Wednesday, August 8 - A Conversation with Chris Lehmann: PROSPERITY AND POLITICS: THE AMERICAN NIGHTMARE, 7 pm, Lovell Showroom, 426 14th Street, Astoria. Doors open at 6:30 pm. Free and open to everyone. Snacks and drinks available for purchase. Doors open at 6:15 pm. Hosted by INCO Astoria Community Group. All Indivisibles from everywhere are invited to walk with INCO. Dress in red, white and blue clothing. The parade starts at 12 noon, but we will be decorating by 10:00 am. The parade gathers by number on Necanicum Drive. We will know the number 1-2 days before. Call Kathleen if questions- 971-404-7192. You can help get the proposed assault weapons ban on the Oregon ballot in November. Advocates for IP43 have until July 6 to get enough signatures to please this proposal on the ballot. You can gather signatures after a brief online training. 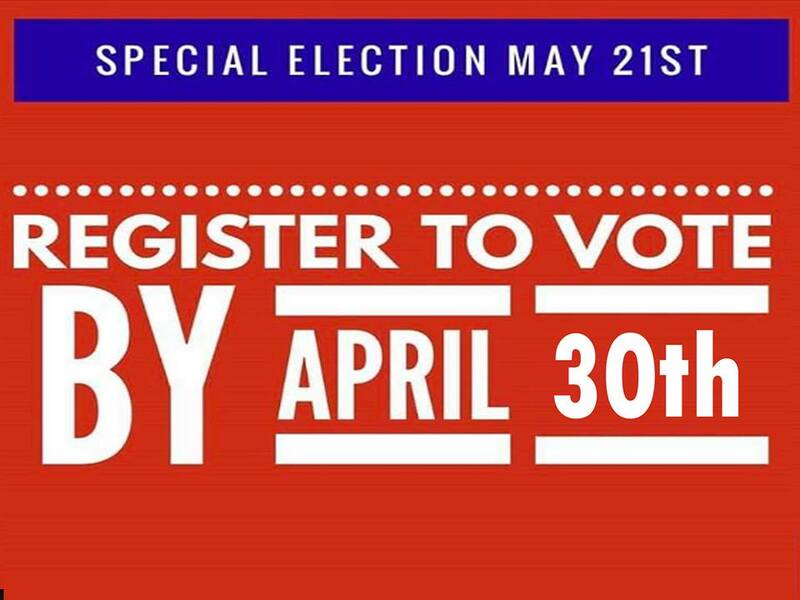 Click on the "Gather Signatures" tab to get started. It takes about 20 minutes. Senators Wyden and Merkley have introduced a bill requiring paper ballots in federal elections as well as risk-limited audits. This looks like a great bill to introduce election integrity nationally. 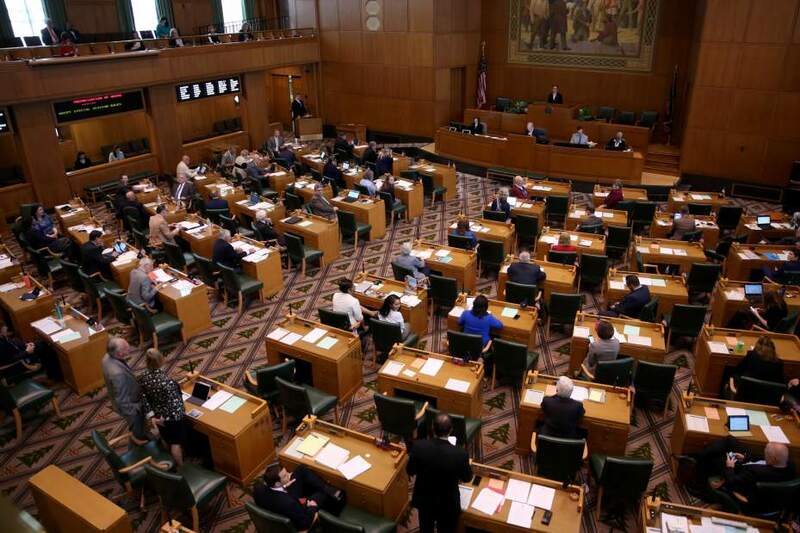 Oregon Representative Bluemenauer has introduced the same bill into the Congress. Here is info on this bill, H.R. 6093. Ask Representative Bonamici to co-sponsor and get this passed. When voters don't trust their voting systems, they don't vote. When citizens don't vote, we lose our democracy. 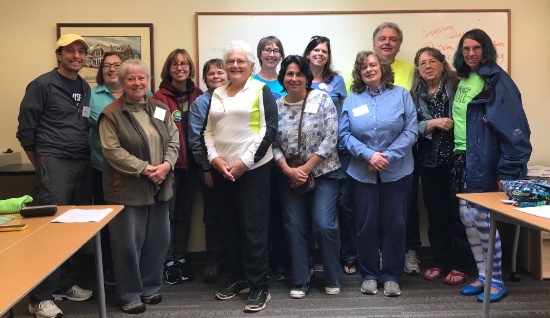 Thanks to Bebe, Deb, Eric, and Laura for training new canvassers to get out the progressive vote in the August 7 Washington State primary. Thanks to INCO WA for their enthusiastic participation. Watch out, Jaime Herrera-Buetler, as INCO Storms the Midterms! Local progressives are working to win seats in nearby Congressional districts. Washington voters will decide on August 7th who’ll oppose incumbent Trumpster, Republican Jaime Herrera-Buetler, in November. Jamie McLeod-Skinner is running to unseat the incumbent , Trump-enthusiast Greg Walden in Oregon - see the map below. For the latest events and information, follow her on Facebook and subscribe to her YouTube channel. Walden was a leader in pushing TrumpCare to replace the Affordable Care Act (ObamaCare). Important actions you can do at home, from your kitchen table, anytime. TEXT: Sign up at textthevote.com to help get out the vote in upcoming elections nationwide. We’ll be adding local texting options soon. DONATE to a candidate willing to stand up to this administration. Order 'I am the Storm' t-shirts here. 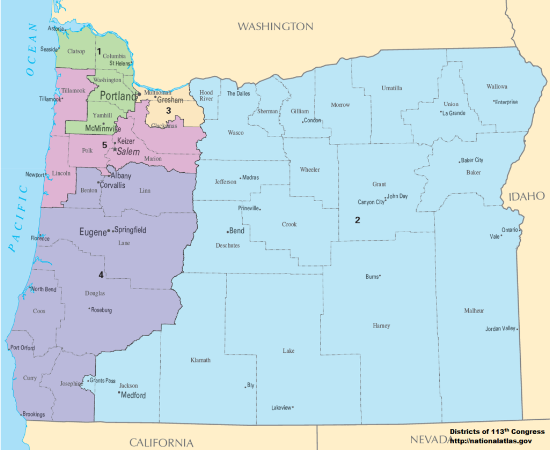 Oregon's Congressional District 2, the light blue area above, is one of the largest geographically in the US. It will take a lot of us to help Jamie McLeod-Skinner unseat the incumbent US Representative, Trump-enthusiast Greg Walden. Voting. Elections. Candidates. Storming the Midterms. Support democracy with INCO's Vote the Future Team. Lots going on - and you can help! Check Happenings for meeting info. And check out our Vote the Future website. Contact Bebe at littlebylittle4change@gmail.com for the Gearhart address. We provide postcards, pens, and postage. And good company, of course. We'd love for you to join us afterwards for food and drink at the nearby Sand Trap. It's easy to sign up for www.postcardstovoters.org - they'll send you guidelines, and you can anonymously contact anonymous voters elsewhere at your convenience. Free and open to all. Doors open at 6:15 pm. Join Chris Lehmann, editor of The Baffler and author of The Money Cult and Rich People Things, for an on-stage conversation on how and why money corrupts American democracy and what we can do about it. Light fare and drinks available for purchase. Donations welcome. "When elected officials speak as though they are above the truth, they will act as though they are above the law. And when we tolerate dishonesty, we get criminality.